Following the 1-1 draw at Balaídos, there were some nerves in the build up to Thursday’s Copa del Rey round of 16 second leg. But those concerns were soon dispelled as Barça stormed off the blocks and with four goals in the first 31 minutes, the remaining hour was nothing more than a formality. And Leo Messi, once again, was the hero. That spectacular performance means that Barça will be joining Atlético Madrid, Valencia, Alavés, Leganés, Real Madrid, Sevilla and Espanyol in Friday’s quarter final draw – and the team chasing a fourth consecutive title is the one that everyone will be hoping to avoid. The blaugrana immediately looked the more settled of the two teams, and the Jordi Alba–Leo Messi connection was in full flow from the start. That connection would end up producing two goals in the space of just three minutes, the second almost a carbon copy of the first. Both were classic Alba balls from the byline, straight into the danger zone where he knew by instinct that the Argentinian would be waiting. Messi was indeed quick to get on the end of both passes, and on both occasions required just a single touch to send the ball goalward. As the chances started flowing with almost embarrassing ease, the roles were reversed on 28 minutes. 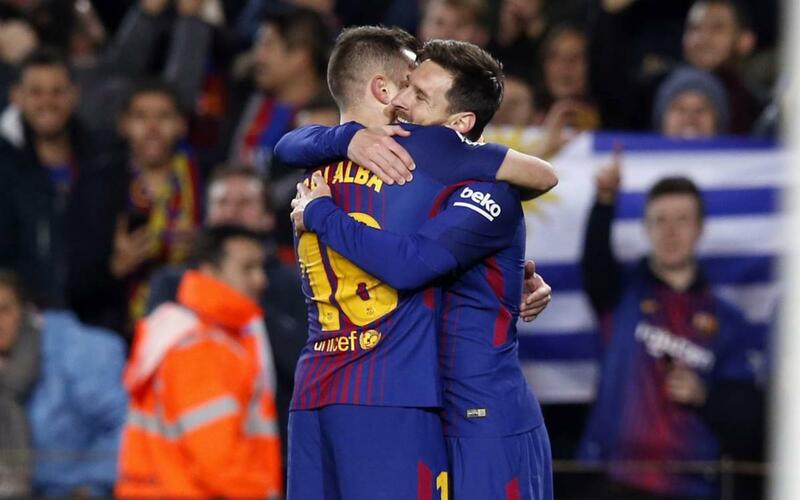 Messi repaid Alba for his two assists with a long, inch-perfect delivery into the box that the full-back met in style and hammered home. The Catalans were running riot. Mere moments later, they put the game well and truly to bed with an hour left to play when Luis Suárez pounced on a defensive mix-up to bung in goal number four. With Barça aware that the job was as good as done, and Celta equally aware that they were fighting a lost cause, the second half was never going to be the most dramatic of affairs. Indeed, Ernesto Valverde gradually withdrew each of Gerard Piqué, Messi and Andrés Iniesta, safe in the knowledge that their services would be best reserved for future occasions. The substitutes included Ousmane Dembélé, who was able to offer the Camp Nou several moments of class. The French starlet who was also involved in the fifth and final goal of the game – a corner served directly onto the unmarked head of an Ivan Rakitic who made no mistake with the conversion. And so a far less tense than we had perhaps expected drew to a somewhat anti-climatic close. Attention can now turn to tomorrow’s draw at 12.30pm CET, with Barça now one step closer on their quest to make Spanish Cup history.